Donât miss this stunning home! Lovingly cared for by original owner in pristine condition. Mere steps to community pool/playground and situated on an OVERSIZED lot, 12 ft wider than standard. 3 bedrooms plus HUGE upstairs bonus room. Fabulous screened in front porch to relax w/your morning coffee. Living/dining room combo. DREAM kitchen featuring maple cabinetry w/crown, bottom cabinets with pull outs, center prep island, granite counters, oversized pantry and breakfast nook all overlooking HUGE family room. Family room enjoys vaulted ceiling and loads of natural light w/high set architectural windows & triple sliders to Fabulous screened lanai & backyard. Master retreat is King sized w/oversized walk in closet and luxurious bath featuring double sink vanity with corian countertop, relaxing soaking tub, separate shower and linen closet. The secondary bedrooms are tucked back off the family room with linen closet and full bath. The laundry is located off the kitchen w/a 6' folding counter & shelf above laundry for storage. The backyard is an oasis featuring fully fenced rear yard, brick paver patio along back of home and walks down the side. Fire pit area, artificial turf area, hammock area (hammock is negotiable) and even a storage shed tucked at the side. Dishwasher & disposal replaced 2016. Subterranean Termite bond with Massey since construction & dry wood bond added after. A/C has been regularly maintained on a semi-annual service plan. 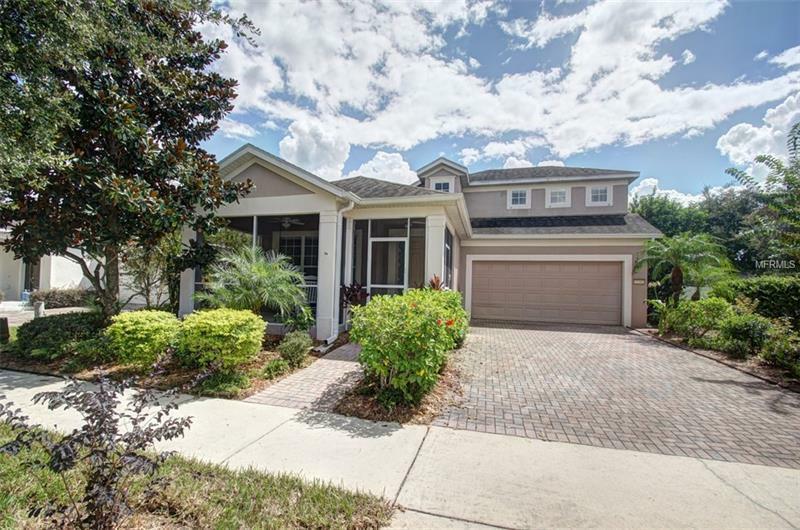 All located minutes to Disney, shopping & highly rated schools.